"'My brother was Theteles, and we were of the house of Chelkus, scientists and noblemen of Ophir. By special permission of the king of Stygia, my brother was allowed to go to Kheshatta, the city of magicians, to study their arts, and I accompanied him. He was only a boy -- younger than myself...' her voice faltered and broke." -- Robert E. Howard: "The Vale of Lost Women"
A city of magicians in southern Stygia, situated on the north-south caravan route from Kush. At the fall of the empire of Acheron three millenia before Conan's time, Kheshatta was a minor trading village near the west coast of Stygia. Far to the east, fur-cloaked, chain-mailed Hyborian barbarians came down from the cold north to sack and destroy the great cities of Acheron, purple-pillared Python and ivory-domed Kutchemes. 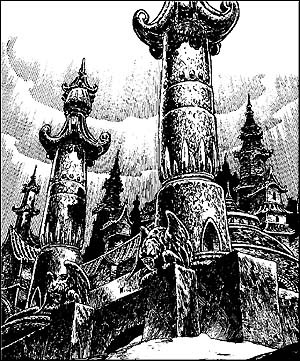 South of the river Styx, the great city of Pteion (reputedly built by the serpentmen), was the stronghold of the black magicians of Old Stygia. 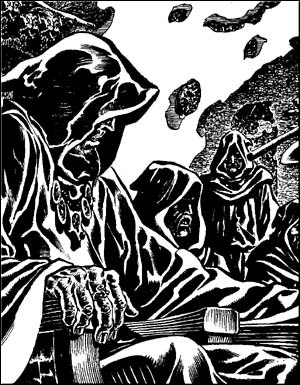 Recognizing the threat of the barbarian horde, they gathered to unleash terrible sorcerous forces which decimated the Hyborians, repulsing them north of the great river. According to legends, this cataclysm invoked by the Stygians created much of the great Kharamun desert. As the northern barbarians retreated to settle the northern kingdoms, the desert sands encroached upon Pteion. Over the centuries, the great city was abandoned and became ghoul-haunted. Caravans of black magicians, laden with eldritch treasure and forbidden papyri, journeyed west, to settle at last in Kheshatta. Thus Kheshatta became the new seat of the black magicians of Stygia and the headquarters of the Black Ring. The city is ruled by the magicians; neither the snake-worshipping priesthood of Set, nor the king on the Ivory Throne in Luxur has any power in Kheshatta. The magicians live in great mansions and palaces according to their status within the Black Ring, while the rest of the city is a sprawling mass of mud-brick buildings which house their servants and personal armies, as well as a growing population of foreigners, merchants, beggars and thieves. In many ways, Kheshatta is more accessible to foreigners than other Stygian cities, because the wizard-rulers of the city are embroiled in nefarious plots and arcane research. The walls and buildings of the city are decorated with hideous basalt gargoyles and obsidian sphinxes, each said to contain an imprisoned demon. The spires of the wizards' towers stretch to the skies, while labyrinthine underground passages and chambers honeycomb the earth beneath the city streets. The magicians meet in secret conclaves in dimly lit vaults guarded by powerful spells and magical and undead guardians. Surrounded by desert, Kheshatta lies strategically on the north-south caravan road to Kush. The city has a slave market, as well as several small bazaars and caravanserais. The merchants know that the wizards will pay well for exotic goods brought from all over the Hyborian world, and thus the caravans are often loaded with special items bound for the markets and bazaars of Kheshatta, such as lotus drugs, metals and gems of unknown origin, body parts of exotic animals, and magical treasures from as far as Khitai. The atmosphere of the city is one of secret alliances, attempted assassinations (both mundane and magical), back-stabbing and constant jockeying for power among the magicians. Officially, there is peace between the wizards of the Black Ring, but even Thoth-Amon's leadership of the Ring and position as Prince of Magicians is openly contested by Thutothmes, a powerful wizard of Khemi. References: The Vale of Lost Women. Authority figure(s): Thoth-Amon, male Stygian Clr2/Wiz16 (Lord of the Black Ring, Prince of Magicians, based in Khajar oasis); Thutothmes, male Stygian Wiz15 (member of the Black Ring, based in Khemi). Important characters: Athyr-Bast, female Stygian Wiz13 (member of the Black Ring); Khebet-Haan, male Stygian Ari10 (merchant prince); Buto-Desh, male Stygian Com8 (slave lord); Zula, male Kushite Ftr9/Wiz6 (Lord of the House of Sho-Onoru). Notes: Kheshatta has an exceptional number of high-level characters in relation to its size. The true numbers of the Black Ring is unknown, but there is at least one hundred Black Wizards in Kheshatta, of all power levels.